Barack Obama has had not only his most stable year of job approval polling, but quite likely the most stable year ever recorded for any president (since scientific public opinion polling began). Now, this doesn't mean Obama's been charting extraordinarily good numbers (he is roughly 13 points lower than President Bill Clinton was, at this point in his second term), nor extraordinarily bad numbers (Obama is also polling 13 points above where George W. Bush was, at this point) -- but Obama's numbers have indeed been extraordinarily stable. Both his job approval monthly average and his job disapproval monthly average have kept within a range of around one percent, all year long. You can see this in the chart. 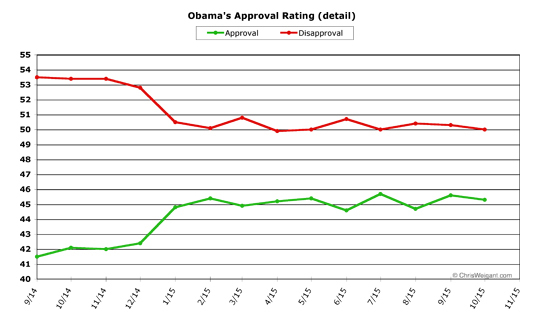 Just before the calendar year began, Obama got a big spike upwards in job approval. Since January, however, things have been pretty flat. 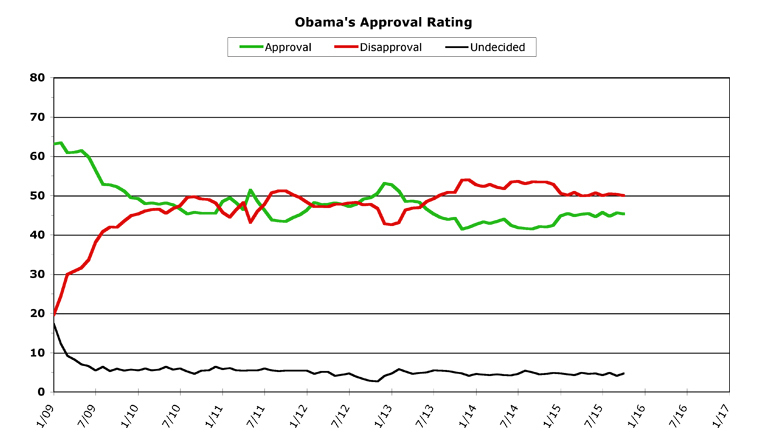 Obama finished October with no net gain or loss. His job approval number inched down 0.3 points to finish the month at 45.3 percent. His job disapproval number balanced this loss by improving by exactly the same amount, to finish at 50.0 percent. The difference between the two stayed at 4.7 percent, unchanged from last month. The president wasn't in the news all that much last month, which may be a major reason why his numbers didn't change all that much. Or perhaps, as we approach the final year of his presidency, everyone's just already made up their minds about him. Either way, there were a few minor news items from the White House, but nothing made a big splash in the headlines. This was mostly due to the continuing focus on the presidential nomination race, of course. October saw the first Democratic debate and the third Republican debate, both of which dominated the political news. The Democratic side has been reduced to three candidates, and Joe Biden finally decided against running. The Republican side is as crazy as ever, with no winnowing in sight. Congress was in the news last month, but the fireworks all the pundits were expecting mostly fizzled (with the exception of the speaker race). John Boehner put together a "barn-cleaning" final deal with the Democrats and the White House, but it was of the nature of the "dog that didn't bark in the night," since some were predicting another government shutdown or debt default -- neither of which happened, as a result of Boehner's final swansong. The House Republicans once again astonished everyone at their ineptitude when the man hand-picked for speaker had to hastily withdraw his candidacy -- and then every Republican in Washington had to go on bended knee before Paul Ryan, begging him loudly to save their bacon by accepting the job. And then, to top off this Keystone Kops act, Hillary Clinton emerged completely unscathed from 11 hours of grilling over Benghazi and her emails. Another dud, rather than the fireworks Republicans were expecting. 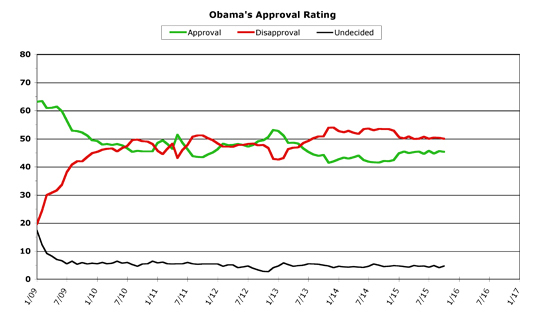 None of this, however, was reflected in Obama's approval ratings, because very little of it had anything to do with him. Within October, Obama's daily job approval average started roughly where he ended last month, at 45.5 percent, then dipped to a mid-month low of 44.6 percent, before recovering up to 46.1 percent by month's end. 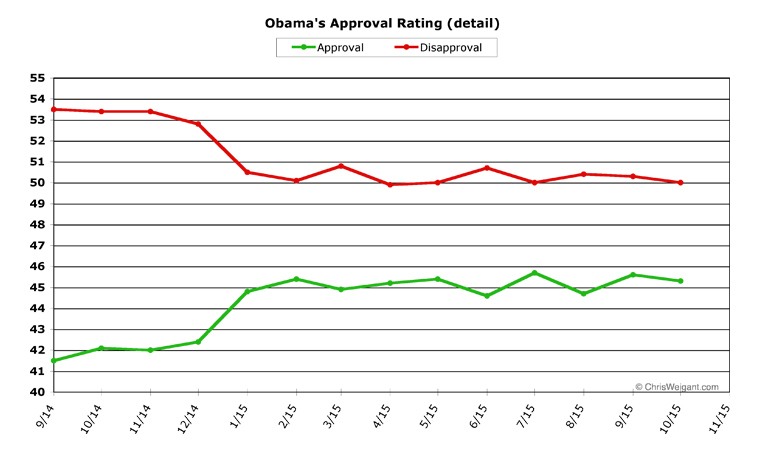 His disapproval numbers were more consistent, although the trend is not as good. Obama started the month with a daily average disapproval rating of 49.2 percent, but this rose fairly steadily throughout the month to hit 51.0 percent towards the end. November doesn't have any enormously-contentious issues on the horizon (at least, that I'm aware of), although it'll be interesting to see how Ryan deals with the Tea Partiers in the House. The next big budget battle won't come until early December, however, so Obama may not be in the news much at all this month. The presidential race continues to heat up, and will also continue to dominate the political headlines. Thanksgiving might boost Obama's ratings purely on a feel-good holiday bump, but even if this happens it likely will fade away afterwards. After watching the first ten months of the year, the safe bet is that Obama will continue to post small gains and losses, but will overall remain remarkably stable. That actually makes sense, Michale ... I'm impressed. Surprised, albeit, but thoroughly impressed. Himself? His best percentages were immediately after his election (low 60s), steady decline over the next year to flatish numbers for most of his tenure, mostly in the 40s. Compared to other presidents in the era of scientific polls, his popularity high water mark seems to be lowest of any, but his lowest popularity (low 40s) is higher than that of LBJ, Nixon,Ford, Carter, HW Bush, GW Bush, and virtually the same as Clinton's. Maybe we should compare his popularity to other branches of government? Like Congress, with an approval of about 13%. Or the Supreme Court, currently at about 45%. The latest poll I can find puts the Republican Party at 32%, Democratic Party at 48%. Maybe the best way to evaluate Obama is to note that government is not popular at present, and Obama holds a position in government. Republicans are Elephants, Democrats are Donkeys, and the electorate is a murder of Angry Birds. "the rise of the oceans would slow and the planet would begin to heal." "There is no red states, there is no blue states, there is only a UNITED States"
i understand the sentiment, but ultimately we need to judge people based on what they have done, not what we expected of them. is obama guilty of raising our expectations? unequivocally yes. as of this day, Obama has delivered mezzo-mezzo results, firmly in the realm of a Taft, a Hayes, or perhaps a Van Buren. Sure we're entitled to be disappointed, perhaps even angry that we've come so far from his initial promise and our initial expectation. but results alone are the standard by which a presidency should be judged. once we get over our disappointment, we must accept that we got an okay presidency - not great, just average. in my view, that's what the poll numbers reflect. ...and the electorate is a murder of Angry Birds. I imagine James Lipton might say it's an outrage of Angry Birds. a murder of Angry Birds. The President finally came out and rejected the Keystone Pipeline: good for him! Michale: To think Keystone was going to provide middle-class jobs shows you are uninformed. There were never going to be any long-term jobs, or rather, a mere handful would remain post-construction. Meanwhile, landowners all along the pathway would have been forced to allow the pipeline through their lands, putting farms, ranches, and communities at risk. The folks who would make the money? The execs in the Canadian company. The folks who would bear the damages when leaks happened? American ranchers, American farmers and American citizens who's water supplies intersected with the pipeline. So I guess you're a !% kind of guy on this one. Obama sold out the middle class in favor of lobbyists, special interests and environmental whack-jobs..
i understand the sentiment, but ultimately we need to judge people based on what they have done, not what we expected of them. If Monsters Inc hires James P Sullivan for his potential and Sully doesn't live up to that potential then James P Sullivan is a failure because he didn't deliver what he promised..
Obama didn't deliver what he promised..
Once upon a time, the Left Wingery (get it?? Birds... Wingery... Wow.. tough room :D heh) actually CARED about domestic surveillance and made hysterical claims such as "Police State!!!" etc etc.. So I guess you're a 1% kind of guy on this one. It's only the environmental whack-jobs who are against it.. So, in reality, it's YOU who is the 1% on this issue..
Once again, Obama's policies are opposed by the majority of Americans.. I thought I had stopped it in time, but apparently not..
[re: 17] take a deep breath and pause michale, because i'm going to write a few words you won't see very often from me. you're absolutely right about this. on domestic surveillance, drone use, and a host of other civil liberties violations, the obama administration has been even more bush-like than bush was, and have largely gotten away with it among a substantial cross-section of lefties, people who ought to know better and be making noise about it.